At first I wasn’t too sure about what we refer to as industrial-style decorating. But it has kind of started to grow on me. I like it coupled with farmhouse decor. As well as modern or eclectic decorating. 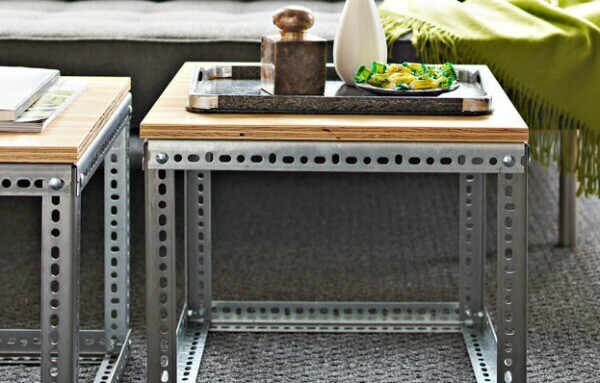 This cute coffee table on wheels is classic industrial style coupled with a vintage vibe. The colorful pillows on the couch adds a bit of cottage flair. The large rug is more elegant, but somehow it looks great with the other elements in the room. 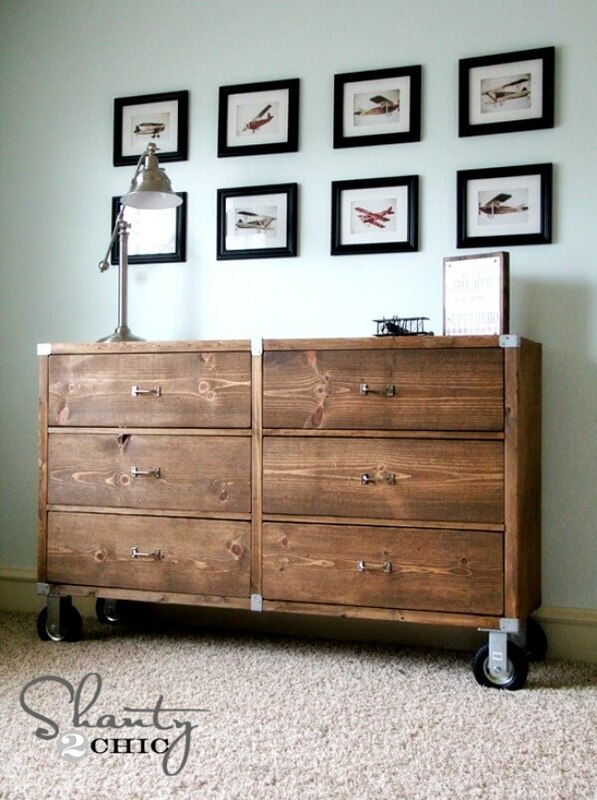 Above is a dresser on wheels with other industrial touches such as the steel detail on the wood. 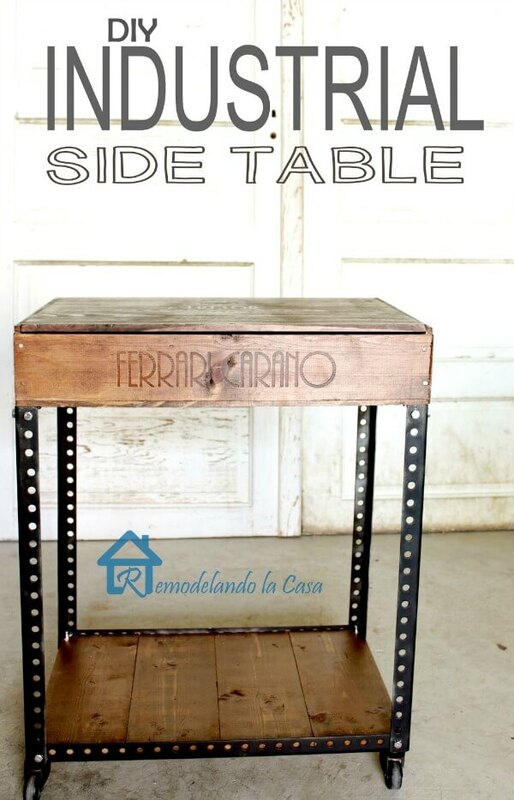 These tables are made with building materials that would seem more commonly found in a contractor’s store room. But that is really the point. 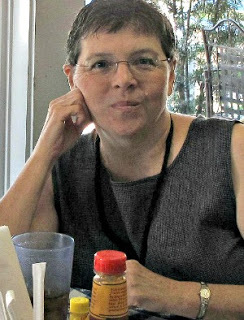 To use things we normally wouldn’t see or use because it is usually found behind the scenes. Monograms are very popular. 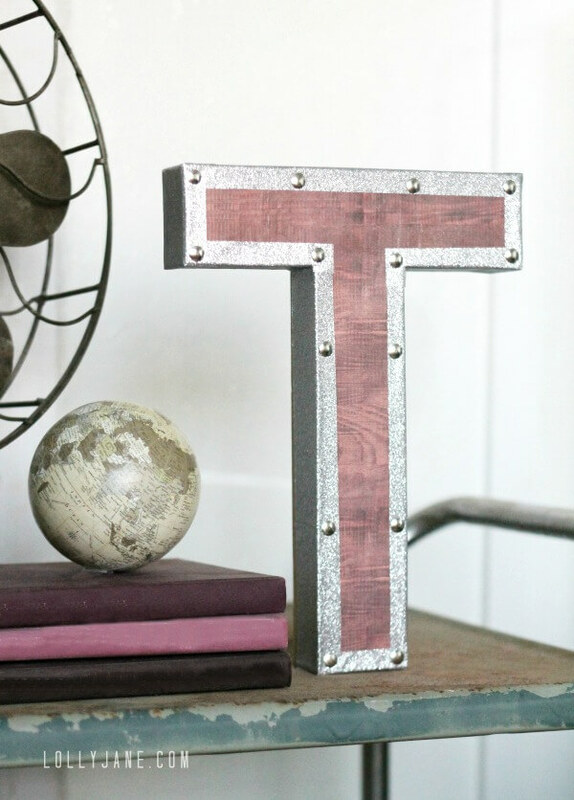 The industrial-style embellishment makes the letter “T” look extra special. It gives it shine and detail that is very appealing. This table looks to be a blogger’s DIY project. I love the black steel coupled with the wood. The top appears to be a box that has been turned into the top surface of the table. It’s very clever and would look great in any room of your home. 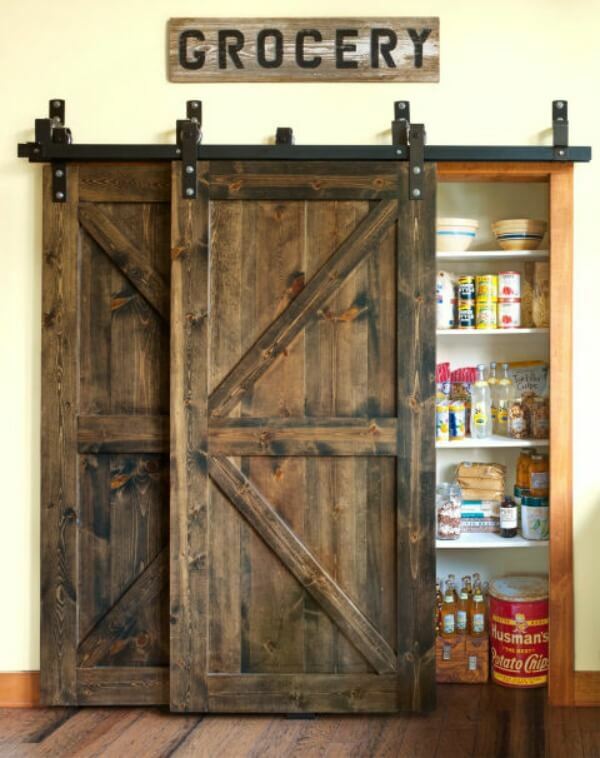 The barn door look is very popular with the farmhouse style decorating crowd. It is also a way of saving space because you don’t have to open the door outward. Instead it slides along the hardware. This particular barn door hides a pantry where food is stored. It is a great look and has been embraced by many decorating enthusiasts. I see it all over Pinterest boards. This entire room gives a nod to the industrial look. 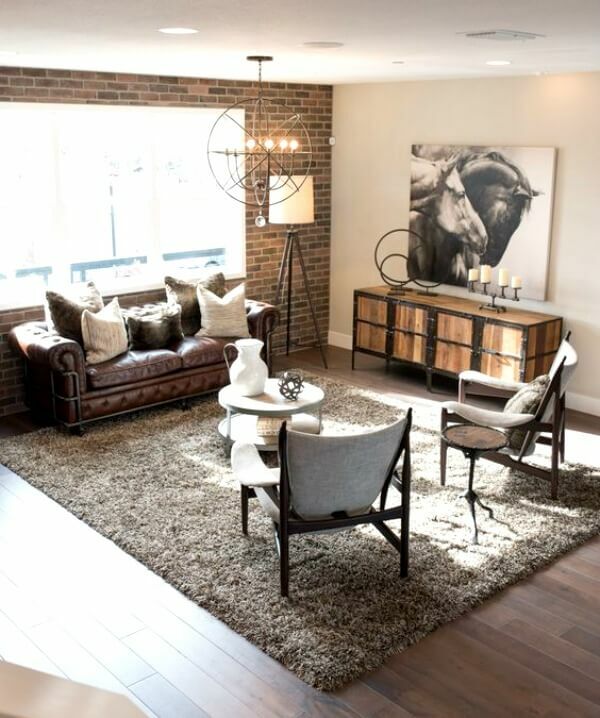 The brick wall is a beautiful element in the space that adds texture and interest. How do you feel about industrial style decorating? I like a few accent pieces and you're right it goes well with farmhouse style. I ki have a few touches in my home, but of course I wouldn't like an entire room dedicated to any one particular style. Love that pantry!! 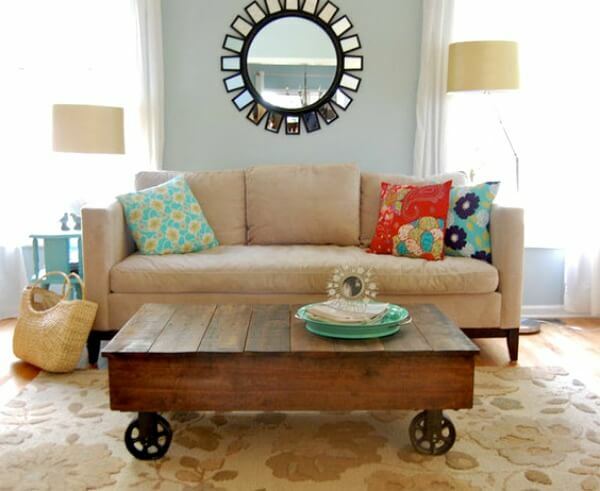 I'm not fond of it at all…the coffee table on wheels is kind of cute..the style is fine for others…just not my style. I love it…the pantry doors are wonderful! LOVE the horse picture in the last photo. Fabulous! I am not to much into the industrial look.. But enjoyed looking at these. Thanks for sharing. Like the barn doors.I would use some accent pieces. I like touches of it, but haven't really incorporated it in my home. I have lots of painted furniture. I love color and I don't like those rooms that look like a black and white photo. I guess that's what they're going for, a vintage look. Love the upcycling of the industrial look. I like some industrial touches. I'm just not a frou-frou type person. I've got lots of bright accent colours like you, Brenda,because who can resist their cheerfulness? What I like about the industrial look is that the pieces don't need to be pristine. I like to feel comfortable in my house in every single room. I used to have a home with a large formal living and dining room. We entertained often but those rooms were never used. Looked beautiful but not really a true living space for my kids, their friends and my husband's and my friends.